Feldpausch Foundation hosted its seventh annual golf outing raising $18,100 for the Bronson Battle Creek Cancer Care Medication Fund. This fund assures that cancer patients who have little or no insurance will have access to needed medications for their treatments. “My deepest appreciation goes out to all who made this golf outing such a success again,” said Corey LaGro, golf outing coordinator. Feldpausch Foundation was formed through the success of a three-generation grocery chain founded in Hastings, Michigan in 1933. It invests its resources in local charitable causes. Nearly $150,000 has been raised through these golf outings over the past seven years for local cancer programs. 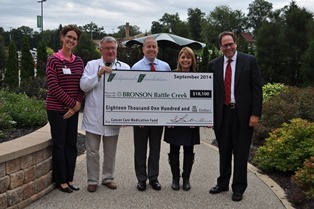 Article above from the Bronson Healthcare E-Newsletter, September 2014.